Sarah Crichton Books, 9780374533571, 304pp. A heartwarming New York Times bestselling novel, now a major movie by David O. Russell—nominated for eight Academy Awards (including Best Picture), four Golden Globes, and four Screen Actors Guild Awards! David O. Russell's adaptation of The Silver Linings Playbook features Bradley Cooper (People magazine's Sexiest Man Alive) in the role of Pat, alongside Jennifer Lawrence, Robert De Niro, Julia Stiles, Chris Tucker, and Jacki Weaver. As the award-winning novelist Justin Cronin put it: "Tender, soulful, hilarious, and true, The Silver Linings Playbook is a wonderful debut." In the six months that followed his leaving teaching and the Philadelphia area, Matthew Quick floated down the Peruvian Amazon and formed 'The Bardbarians' (a two-man literary circle), backpacked around Southern Africa, hiked to the bottom of a snowy Grand Canyon, soul-searched, and finally began writing full-time. His debut novel, The Silver Linings Playbook, was adapted into the Oscar-winning movie starring Bradley Cooper and Jennifer Lawrence. Matthew earned his Creative Writing MFA through Goddard College. He has since returned to the Philadelphia area, where he lives with his wife and their greyhound. How does the book redefine happy endings? What makes Pat so determined to believe that every cloud has a silver lining? As Pat heals from his brain injuries and trauma, in what ways is he sometimes more mentally stable than his family and friends? Is his optimism—combined with his belief that God is a filmmaker—a sign of his sanity? How was your reading affected by the fact that the “bad place” was a neural health facility rather than a psychiatric hospital? Discuss the relationships Pat and Jake have with their father, Patrick Senior. What does their father teach them about being a man? Why is it so hard for him to show emotion? How does Cliff use the Eagles’ playbook to teach Pat about the real world? How do the Eagles bring unity to Pat’s family? What makes Hank Baskett the ideal rookie to serve as Pat’s inspiration? In “A Hive Full of Green Bees,” what does Pat discover about himself during the violent incident with the Giants fan (Steve)? How did you feel about Jake while he was taunting Steve? What keeps Pat’s obsession with Nikki alive? What does Cliff ultimately help him understand about the nature of love and attraction? Tiffany and Pat’s mother, Jeanie, have different approaches to his recovery. Tiffany believes that direct confrontation is best; Jeanie wants to protect Pat from anything that might upset him, including his brother’s marriage to Caitlin. Which approach is better? How did your impressions of Nikki and Tiffany shift throughout the novel? Did Dance Away Depression have any healing effect on Pat? What did Tiffany want him to hear when she chose “Total Eclipse of the Heart” as their song? What role does Danny play, along with Aunt Jasmine, in rescuing Pat emotionally on Christmas Day? When have you had a similar encounter with a friend who appeared at exactly the right moment? How did you react when Pat finally remembers why Kenny G pushes him over the edge? What does his trauma have in common with Tiffany’s? Discuss Pat’s take on literature, particularly The Scarlet Letter, The Bell Jar, The Adventures of Huckleberry Finn, and The Catcher in the Rye. How does his approach to literature change as his worldview changes? What would it be like to have Pat as a member of your book club? In “An Acceptable Form of Coping,” Cliff and Pat disagree about whether sad books should be required reading for students. Pat says that such books teach kids to be pessimistic. Cliff says, “Life is hard, Pat, and children have to be told how hard life can be . . . so they will be sympathetic to others.” What’s your opinion? What books were you drawn to when you were younger? Discuss the book’s closing scene. 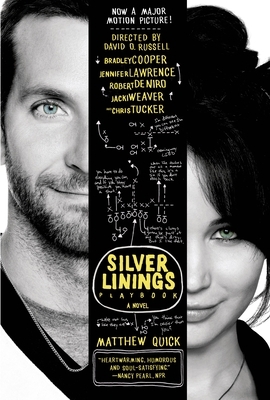 How has The Silver Linings Playbook inspired you in your life?